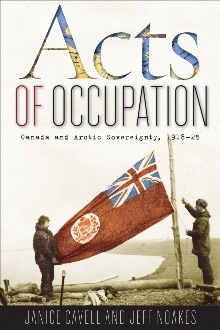 Acts of Occupation has been shortlisted for the Canadian Historical Association’s Political History Group‘s 2012 Book Prize. See the entire shortlist on the Political History Group’s website. In Chapter 4 of the book, we talk about the ultimately unrealized plans for the Eatons to help sponsor a proposed Arctic expedition by Shackleton. Whether by luck or by planning, Shackleton and Lady Eaton were fellow passengers on the Aquitania during one of its trips from New York City to Europe. This photograph was likely taken in New York City shortly before Aquitania‘s departure, and shows Shackleton (right) and the Eatons (centre). We discovered it after the book had gone to press, so we’re sharing it with people online. Despite these minor shortcomings, this well-written and readable work deserves a place on the bookshelves of historians, students, and popular readers interested in the Canadian Arctic. High-quality photographs and maps add to the story of adventure, exploration, and intrigue that the authors set out to tell. Moreover, this history is both timely and important. The recent flurry of books on the Canadian North has included several broad and sweeping studies of Canada’s Arctic policy, notably Polar Imperative by Shelagh Grant (2010) and Arctic Front by Ken Coates et al. (2010); however, more detailed works that fully explore the contours of Canada’s Arctic policy are required. Other historians should follow the lead of Cavell and Noakes to describe the progression of Canada’s policy since the country received its Arctic Archipelago in 1880 because many historical policy issues are still germane to debates about the Arctic today. Read the review on the journal’s website. Much recommends the book. Cavell and Noakes conducted thorough research, digging deep in multiple archival holdings. Because of the narrow time examined, they could follow every lead to its conclusion, often through multiple layers of archives and deliberate misdirections by the cast of characters. Also, Acts of Occupation is a well-written narrative that takes what might have been a dull account of bureaucratic and political wrangling and turns it into an exciting and significant book. Read the full review on the H-Net website.